Escape to River Cottage is the theme at the cooking club this week and I have a list of recipes from Hugh Fearnley-Whittingstall’s books so I begin with a simple asparagus with sautéed mushrooms as a side dish for Hugh’s pan seared pork chops with rosemary, garlic, chilis and anchovies…yes anchovies so don’t run for the hills already because you just haaate anchovies, anchovies flavor a lot of things these days and actually melt away and when you add water, broth or cider you have a wonderful pan sauce for the chops. I didn’t deviate too much, from the recipe, but I substituted chicken broth and I did cut back on the anchovies for 2 chops using 4 instead of 8. Red pepper flakes stood in for the chili pepper since I have the Asian ones that are very hot. Link below for Hugh’s original recipe. Heat a skillet over a medium heat and add the oil. 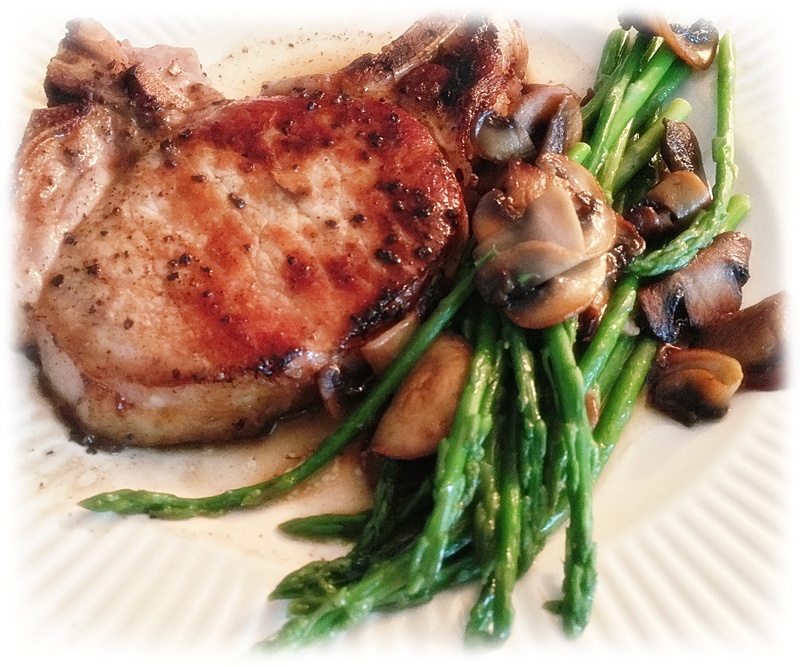 Season the pork chops all over with salt and pepper, then add them to the pan.